These USB adapter cables let you use your hard disk drive via your USB connection. They have both a 2.5 inch and a 3.5 inch IDE connector as well as a SATA connector. 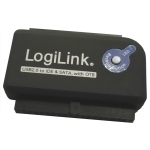 They are compliant with USB 2.0, support SATA and SATA II and are compliant with USB mass ATA/ATAPI Ultra DMA mode. This unit plugs directly into the back of 2.5" and 3.5" IDE drives. For connection to SATA disk drives the unit is supplied with a short SATA cable. The unit is also supplied complete with an external UK mains power supply terminating in a 5.25" molex power connector for connection directly into the back of a 3.5" HDD. The power unit is also includes a 4-pin Molex to SATA power adapter to enable SATA disk drives to be powered(2.5 inch IDE drives power directly from the USB bus). To clarify, the unit itself is powered from the USB bus, but you may need to power the disk drive seperately and we include a UK mains PSU for this. 3.5" and SATA drives need this power connected, whereas 2.5" laptop drives do not require this external power as they are powered from the USB bus.